Today’s readers of science fiction and fantasy have an appetite for stories that address a wide variety of voices, perspectives, and styles. There is an openness to experiment and pushing boundaries, combined with the classic desire to read about space ships and dragons, future technology and ancient magic, and the places where they intersect. Contemporary science fiction and fantasy looks to accomplish the same goal as ever—to illuminate what it means to be human. 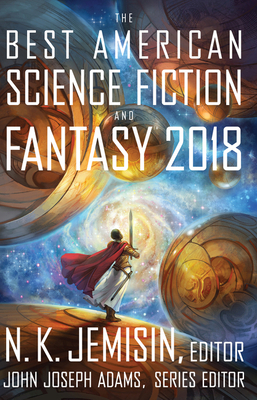 With a diverse selection of stories chosen by series editor John Joseph Adams and guest editor N. K. Jemisin, The Best American Science Fiction and Fantasy 2018 explores the ever-expanding and changing world of SFF today, with Jemisin bringing her lyrical, endlessly curious point of view to the series’ latest edition. JOHN JOSEPH ADAMS is the series editor of Best American Science Fiction & Fantasy, as well as many other anthologies, such as Wastelands, The Living Dead, and The Apocalypse Triptych. He is also the editor and publisher of the magazines Nightmare and the Hugo Award-winning Lightspeed, and is a producer for WIRED’s The Geek’s Guide to the Galaxy podcast. He lives in California. N. K. JEMISIN is the author of several novels, including The Fifth Season, which won the Locus and Hugo awards (making her the first black author to win either award for best novel). Her short fiction and novels have also been multiply nominated for the Nebula and the World Fantasy Award, and short-listed for the Crawford and the Tiptree. She writes the bimonthly “Otherworldly” column at the New York Times Book Review. She lives in Brooklyn, New York.